Do you like to hunt, watch wildlife, or explore the great outdoors? If so, the Bushnell Legend Ultra HD E-Series Binocular was made with you in mind. 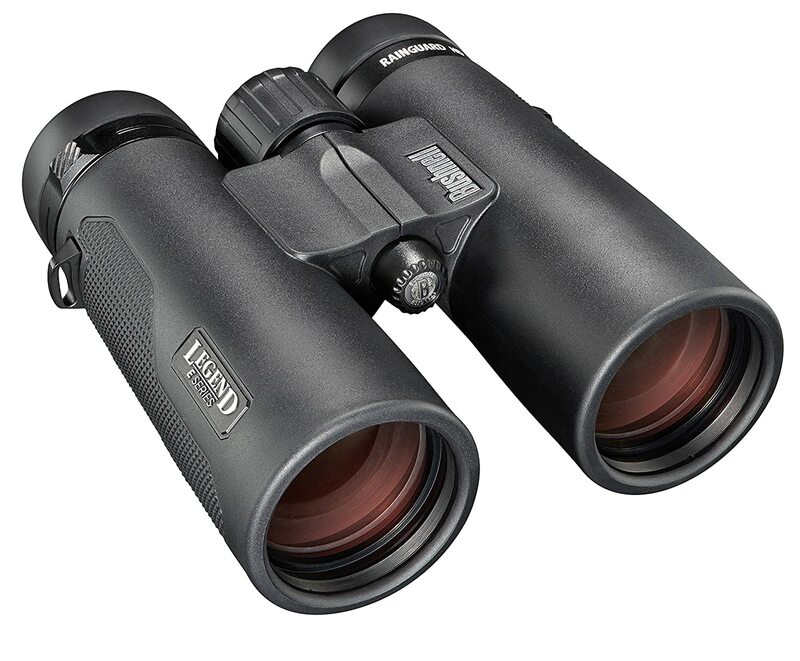 Designed to help outdoor enthusiasts see the beauty of the world around them, these premium binos are ideal for birdwatching, hunting, traveling, or spending the day trackside and checking out all of the action. The Legend Ultra HD E-Series Binocular features a top-notch rubber-coated magnesium chassis and the premium optics we’ve all come to expect from the Bushnell brand. It’s sleek and fashionable yet rugged and more than capable of providing superior performance in any situation or environment. It is a decent option in the crowded field of binoculars. The Bushnell Legend Ultra HD E-Series Binocular delivers premium features specifically designed to ruggedly withstand the wear and tear of any outdoorsman. With Bak-4 phase corrected prisms and a fully multi-coated lens system with extra-wide band coatings, it produces extremely bright and crisp images with perfect color rendition. Thanks to its waterproof housing and Bushnell’s proprietary RainGuard HD technology as well, there’s no other bino out there as trail-ready as the Legend E-Series. With these Bushnells around your neck, you’ll never be afraid to take your binoculars to the beach, river, or jungle ever again. Like all Bushnell Legends, these binos are O-ring sealed and nitrogen purged for unhindered performance rain, snow, or shine. In addition to its tried and tested waterproof housing, the Legend Ultra HD E-Series also features Bushnell’s patented RainGuard HD water-repellent coating for superior waterproof protection. Unlike other so-called “waterproof” binoculars, the RainGuard HD technology of the Legend Ultra HD E-Series causes the water to bead on the lenses, thus not affecting their sharpness or contrast. This makes the Legend truly unique. For ultimate brightness, incredibly sharp viewing, and the truest of colors, every air-to-glass surface of the Bushnell Legend Ultra HD E-Series Binocular features several layers of anti-reflective, ultra-wide band coatings. The result is a fully multi-coated optical system that delivers incredibly bright and sharp high-contrast images. To top it all off, this Bushnell features top-quality phase-coated BaK-4 prisms and lead-free glass lenses as well, making it eco-friendly and even more dynamic. As noted above, the rugged Bushnell Legend Ultra HD E-Series Binocular has a noticeably lightweight magnesium chassis in a modern and super tough roof prism design. The impressive chassis is coated in rubber armor, providing you with the protection and comfort you need for regular outdoor use. The rubber-coated bino also features a textured grip and an oversized ridged focus knob, both of which add to its comfort and ease of use. Proving they’ve truly thought of everything, the good folks at Bushnell also designed the Legend Ultra HD E-Series with twist-up eyecups that are surprisingly easy to adjust. With an eye relief of 17.2mm, the popular binocular is also very comfortable for your eyes as there’s plenty of room even for those wearing eyeglasses. Of course, there’s an adjustable diopter as well, allowing you to make on the fly vision adjustments for your left or right eye. Thanks to Bushnell’s new and unheard of no questions asked lifetime warranty, you have absolutely nothing to worry about when you purchase these amazing binos. Whether they’ve been totally crushed, suffered minor accidental damage, or they’re defective in any way, Bushnell will replace or repair your Legend Ultra HDs for no additional charge. Simply send them your proof of purchase and you’ll have a new or repaired pair of binoculars in no time at all. In an effort to provide you with years of crystal clear nature gazing, Bushnell’s Legend Ultra HD E-Series Binoculars are specifically designed with strength and performance in mind. Whether you like to hike, hunt, birdwatch, or partake in any number of other outdoor activities, these top-of-the-line binoculars won’t let you down. With strong optics for super bright and clear images, a lightweight rubber-coated magnesium chassis, water and fog proof construction, and comfortable eyecups with plenty of relief, there’s arguably no better binocular on the market today. So, if you’re a serious outdoor enthusiast in search of the best binocular in the business, look no further than the Bushnell Legend Ultra HD E-Series. Rugged yet refined and designed with performance in mind, these best-in-class binos won’t let you down.